I am noticing ambivalence. As I sit down to write about this next lunar cycle, I lose interest or get distracted by something else. Don’t get me wrong. It’s not that I am no longer in love with astrology. I am. My practice with astrology continues to anchor me in the qualities I want to have in my life—self-awareness, intentionality, and connection to Mystery. All that is still there, yet I am noticing right now that it seems like an effort to engage with what usually brings me joy and purpose. As I struggle with this, wondering where my inspiration is, it occurrs to me that this is the work of the month. My ambivalence is part of the natural cycle mirrored by astrology’s symbols. Pisces is the starring energy of this New Moon. The constellation shows two fish, connected by a cord, swimming in different directions. Ambivalence, being pulled in two directions with no particular fire or heat to encourage one over the other, is a Pisces signal to tune into what we need on a more diffused level of consciousness. Water signs connect us to soul. The Pisces connection to soul develops a new sense of boundary, an ability to be aware of multiple levels and multiple points of view. Our souls need this connection and access to Mystery. Sometimes, even holding intention for what we want to manifest in our lives is inappropriate. Sometimes we are meant to drift in seemingly contrary directions. Just to be held by the ocean is the best luck we could have. It's a total waking up! On this sea journey, if we do not entirely lose ourselves, then we may find a balm for the soul in a secret place intended just for us. Only we can know that this medicine will restore us. No one else can tell. This month, it might look like we are escaping, wasting time, sleeping too much. It might look like we are depressed or isolating ourselves. It might look like losing direction and motivation. It could be any of these things, and it could be just the balm we need, the secret medicine that restores the soul. And here is the other scary thing—we might not know right away whether what we are feeling is all of these debilitating things or if it is the secret medicine, until we awaken on the other side of Pisces. One thing I do know, and I’ve learned this from studying astrology, Spring’s renewal requires us to pay attention to the listless space before we are called back into purpose, will, and intention. We need a rest before we can know the next steps and muster the vital energy. This month, the Piscean siren call to drift and dream will be punctuated by spikes of impulsivity and urgings to coalesce into responsibilities and burdens. What if we entertained the thought that the impulsivity and burdens will only create more unhappiness for us unless we also allow ourselves the sea journey into Mystery? What if we tried to hold everything and nothing all at once? Would it look or feel like two fish, tethered and swimming in different but somehow connected directions? I invite you to experiment with this consciousness this month. Planet stories of the month. 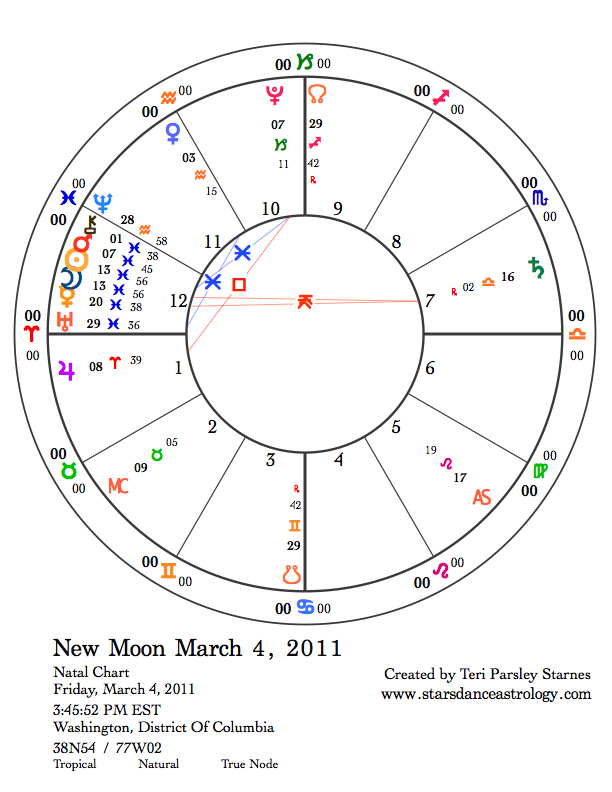 This New Moon chart shows Chiron, Mars, Sun, Moon, Mercury ,and Uranus spanning the entire sign. Chiron has been floating around the end of Aquarius and the beginning of Pisces for a year; now it will stay in this sign until 2018. The ingress of an outer planet into a sign calls our attention to this energy. Chiron, whose teachings are about healing, wisdom, and wounding, has a strong presence in this empathetic sign. Every time our hearts crack open, we are able to bring more connection and more healing to the world. Mars stays in Pisces for most of this month. When the warrior planet enters Aries on April 1, we may feel that spike of impulsivity and impatience. Along with that small spike, Uranus contributes its share of electricity when this planet finally enters Aries after cruising the cusp between Pisces and Aries for the past 9 months. I’ve written a lot about this transit in past months. See last month’s blog for one. The larger Pisces story involves Neptune, the modern ruler of Pisces. Neptune will also be transiting the zone between signs this next year —the cusp between Aquarius and Pisces. The last time Neptune entered its own sign was in 1847-48. 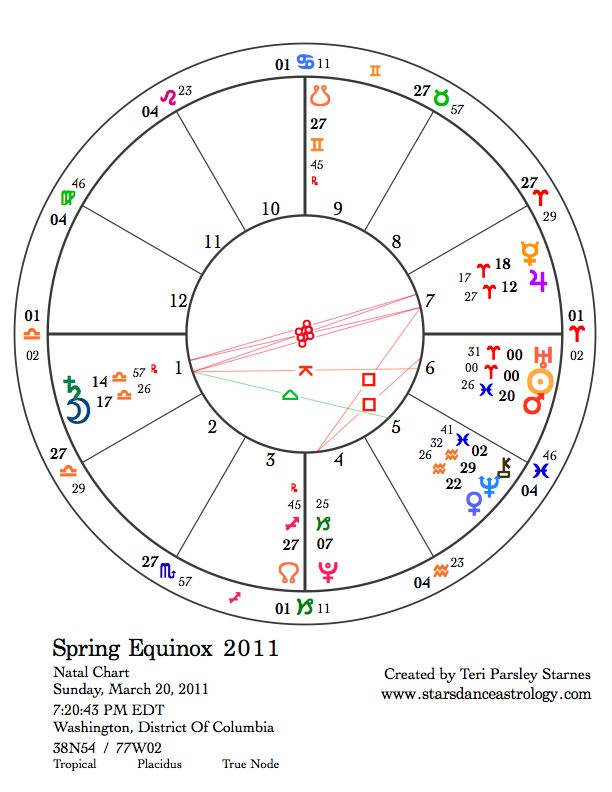 We can look back at events of that time to make some assumptions about what Neptune may bring us this time. Interestingly, The Communist Manifesto was published in 1848. [Uranus was also in Aries at that time.] With the issue of unions featuring strongly in the news, perhaps we will see a resurgence of collective action. Coupled with the revolutionary energy of Uranus we may not see this issue go away anytime soon. Saturn has been quietly occupying the middle degrees of Libra for the past few months, not making any major aspects with other planets. This changes as Jupiter moves into the middle degrees of Aries, opposing Saturn. The issues of selfhood vs. partnership will strengthen, especially at the Full Moon. Oppositions are actually great times to integrate qualities that support each other. If Saturn is calling us into more responsible relationships, Jupiter is asking us to know and assert ourselves well enough to encourage equal partnership in those relationships. 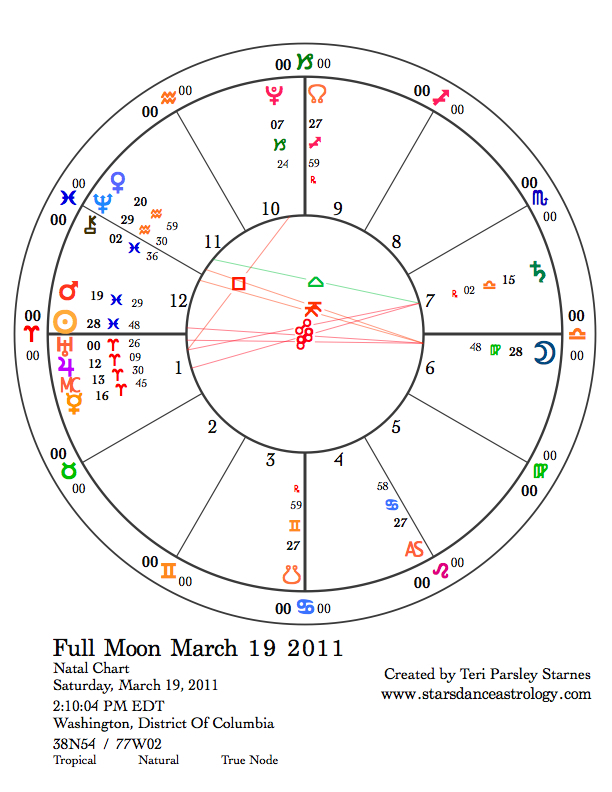 A few days after the Full Moon, the Sun enters Aries. 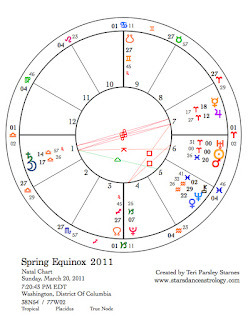 The Aries Ingress chart set for Washington is a picture of what we can expect energetically in our country this Spring. 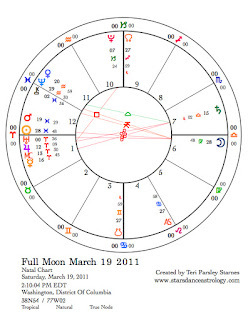 The Sun is exactly conjunct Uranus in Aries, and the Moon is conjunct Saturn in Libra. This looks like a powerful opposition between forces of change and the forces that stand for balance and stability. 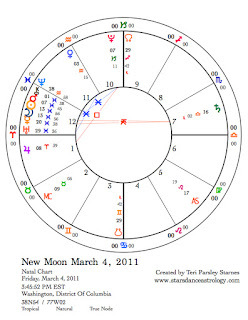 Due to the more angular position of the Sun and Uranus, it looks like the forces of change will stronger. Energy, perhaps anxiety, mounts this month. But we still can recall the Piscean lure to let go, to rest, and to trust in an inner guidance system that makes no sense but knows more than we do about sea journeys. The month ends with another twist. Mercury in Aries turns retrograde. Traveling backwards may get us farther than we think.